Nowadays, we hear a great deal about Video Rental Software for all kinds of commercial establishments. Whether it is a restaurant, a grocery store or even a department store, Video Rental Software is one of the most important management tools that will help keep everything in check at all times. There are some specific requirements expected from Video Rental Software. Unlike most retail stores, a video rental works in a more similar manner to a library. This means that people will borrow videos and they are expected to be returned within a particular duration of time. This means that not only do you have to keep track of what’s available in your video library but also to make sure that you keep track of the customers who borrowed the videos as well as when they have to return them. Traditionally, this was done with the aid of registers and ledgers. Now, thanks to the many Video Rental Software out there, all this can be kept on the right track within a matter of a few clicks. The ideal Video Rental Software or POS system for your video rental store should have the ability to store all the information from your customers. AllianceBundle POS is the ideal option for those of you requiring a video rental software. This includes their names, identification details, age and address along with any contact details. Then, the AllianceBundle POS program will enter the details into a customer database and issue them a membership card that will identify them with the database. Only a member of your video store has the ability to rent from your collection. In addition, you should also be able to create a database on all the videos available in your collection to provide easy access and monitoring. Most video stores work by issuing a code number for each and every video they have at the store. 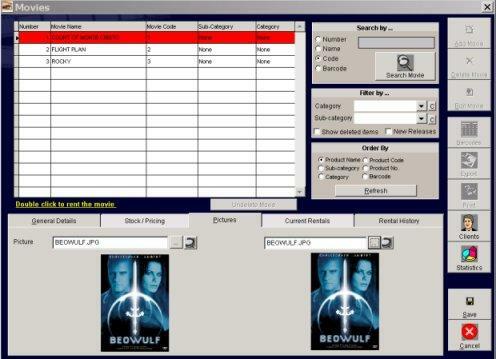 With the AllianceBundle ideal Video Rental Software or POS system, you will be able to look up a requested video by typing its name into the database. As mentioned earlier, the AllianceBundle POS software program can be able to keep track of all the customers, videos as well as the time period they borrow a particular video for. Once a member requests a video for borrowing, the AllianceBundle POS program will offer them a receipt with all the necessary details such as the payment, delay dates and additional charges for late returns. In addition, details on the member who borrowed the video, their contact details as well as the due dates along with their previous rental history get uploaded into the Video Rental Software or POS system. The great thing about letting Video Rental Software program take care of all these matters is the fact that you will always be notified when a due date is missed. This will save you a great deal of time that will otherwise be spent on keeping track of such things. AllianceBundle POS system is not all about managing the transactions in a video store. It can also be used as an effective marketing tool as well as a system that will allow you to offer discounts and treats for your most loyal members to keep them coming back for more.